The following paragraph was quoted in Susan Cain’s recently published book Quiet: The Power of Introverts in a World That Can’t Stop Talking. enough silence around one when one writes, why even night is not night enough. Quiet is a wonderful and reassuring book for those of us who are happiest when we have plenty of time for reading, writing, and reflection. Cain presents the latest research in the fields of neurobiology and psychology as she discusses why the ways in which introverts think and work are just as essential to modern society as the heavily-promoted outgoing, action-based styles of extroverts. This book will give people confidence to choose a career that will help them achieve their potential and find happiness and fulfillment. Other readers may re-evaluate their choices and make life-changing decisions. 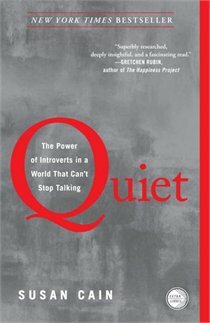 This entry was posted in Books, Creative Musings and tagged Kafka, Quiet: The Power of Introverts in a World That Can't Stop Talking, Susan Cain, writer's solitude by nancytinarirunswrites. Bookmark the permalink.